Alchemy was popular in mediaeval times, so why does it feature so little in your average D&D world? Publisher's blurb: "What good is alchemy? Wizards don't use the Craft (Alchemy) skill to brew potions, they use the Brew Potion feat. Sorcerers don't use it to identify potions, because Spellcraft handles that. So what can characters do with Craft (Alchemy)? Alchemy should be all about using rudimentary science and pseudo-science to replicate magical effects... for example, what is a sunrod if not a long-lasting Light spell? "You have before you a compendium of alchemical items both mundane and marvelous. 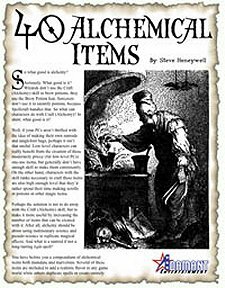 Several of these items are included to add a realistic flavor to any game world while others duplicate spells or create entirely new effects, making Craft (Alchemy) more useful by increasing the number of items that can be created with it."